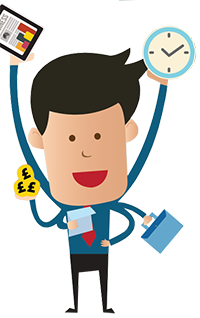 Who wouldn’t welcome more hours in their week to finish their priorities, and have more non work time –not to mention to speed up progress on a new career move? I coach time management 60% of my time – and the rest I concentrate on barriers and opportunities for individuals’ and companies’ growth. If you feel the pain – and lack of motivation that ensues – of being time poor, read on to see the techniques my clients have found most useful, some of which have never graced a text book! 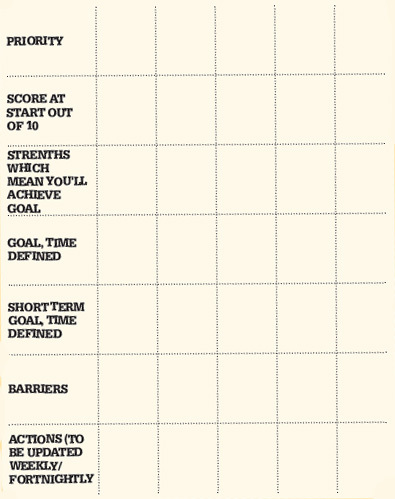 Covey’s grid divides your task list into important and urgent, and is the most useful tool to help you focus on what is important but not deadlined and often such a huge undertaking (like embarking on a job change) that it’s easy to postpone or neglect in favour of more interesting jobs, quick fixes and ‘decluttering’. Once aware of how much time you are spending in Quadrants 3 and 4, you can take steps to reduce it. 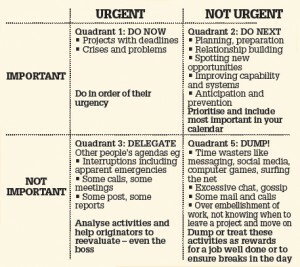 Covey argues the more time you spend in the ‘important and urgent’ quadrant, the more time you spend sucked into Q4 – eg Facebook, messaging, personal emails taking longer than they need etc. 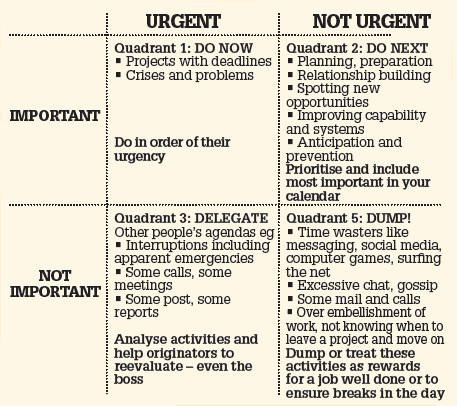 Simply by dividing your task list into the 4 quadrants, makes it easy to see the tasks which will make most difference to your productivity and personal success and to get through the urgent and important duties as fast as possible to make inroads into the most important of these Quadrant 2 activities. I have a client who describes herself as having ‘several planes in the air, but none of them landing’ which means she doesn’t get the sense of satisfaction of progress and indeed completion. She – and many others who are easily distracted or procrastinators – have found this priorities chart invaluable to slice overwhelming must-dos into achievable chunks. By giving yourself a score out of 10, and revisiting the score weekly or so, you can feel your progress and keep on track. 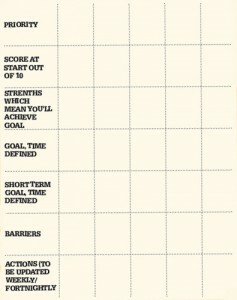 By listing the possible barriers to success, you can work out how to overcome them in advance, and so on. As Abraham Lincoln said, ‘A goal properly set is half way reached’. 3. Everyone can stand to gain from ‘eating a frog for breakfast’, a philosophy and book by Brian Tracy: ‘Eat that frog’. The idea is that if you do the thing of most value to you, however much you may want to resist, ‘the rest of your day will be wonderful’ as you work up a head of steam. It’s a great discipline for procrastinators and individuals who are quickly bored or easily distracted who need to push themselves to do (and finish) the most important things rather than the new project that beckons. Even if the frog is to spend just half an hour on a huge undertaking that never gets going in favour of easier tasks, the sense of wellbeing when done is tangible! Free spirits who are resistant to spending more time on planning than absolutely necessary benefit from using their calendar so that all their top priorities are in one place, with a reasonable amount of time allocated to it. This gives them peace of mind that nothing important will slip, and makes sure the priorities are not overlooked in favour of more appealing assignments. The calendar can be colour coded so that meetings that cannot be juggled are in a different colour from those that can. I also urge clients to think about their peak and slump times and organise the calendar accordingly. Protect the time you are most decisive, problem solving or creative by ensuring you spend that time of day on projects that need maximum clarity of mind. Then diarise activities that you can do standing on your head for when you dip in concentration, such as meetings, emails etc. How much of your job list could be done by someone else? Why isn’t it being done by them? Are there tasks that you hang onto because you have such high standards that you fear no-one will do the task quite like you would? By learning to judge at the outset which undertakings should involve others, and asking for each task ‘is this something I can delegate’, you can achieve so much more and concentrate on the things that really need you and you alone. It’s worth starting by delegating the items that will repeat themselves most or those that need least explanation. It’s surprising how often people relish the learning curve of undertaking the projects that bring others down! 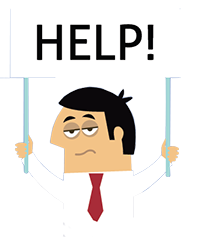 But few people enjoy being micromanaged – important instead to give a good brief with clear objectives and all the support that is needed. – A lot of time is lost by people who are people pleasers and thus suffer from a lack of clear boundaries. The word ‘no’ (diplomatically put) is the biggest time saver! The key to this is preparation: planning ahead what needs to be said and what they would find acceptable if delivered to them. 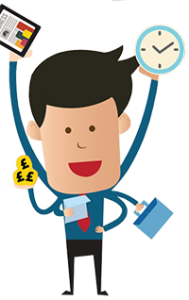 – Others suffer from not knowing when a job is ‘fit for purpose’ and spending more time than necessary of which the last half hour or so actually adds nothing more to the job’s value. These people can benefit from considering Pareto’s law also known as the 80/20 rule: where 20% of your actions generate 80% of your results. Work out what your 20% is! Perhaps also estimate how long something should take and time yourself to get into the habit of stopping earlier. Others are helped by only allowing themselves to spend say half an hour on each task before moving onto the next, so that all their priorities move forward rather than some perfect and some late. – The same people also often suffer from slow decision making, needing to see every fact and figure before making a conclusion. It helps to limit yourself to top line data for less important decisions, and take small risks that will quickly be caught, rather than delaying other work by getting bogged down in details. Diana is an accredited and leading coach with the Coaching Academy and the government’s GrowthAccelerator service and has been consulting for over 20 yrs. 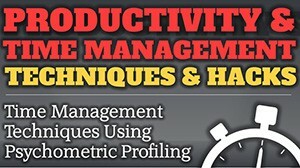 She has just launched her 1-hour time management course online which is available for free to the first 10 readers to use the coupon: https://www.udemy.com/productivity-time-management-techniques-tips-skills-strategies-hacks/?couponCode=ChangingCareersFree Everyone else can subscribe for £21 – 50% of its special launch price – via https://www.udemy.com/productivity-time-management-techniques-tips-skills-strategies-hacks/?couponCode=ChangingCareers The course owes its success to giving viewers free psychometric profiling then tailoring the techniques to how each viewer thinks and feels, their personal ‘DNA’. You can do the course in chapters of 5 minutes or so and at the end you will receive a certificate of completion.